Accessory manufacturer Netatmo has launched its home monitoring system, called the "Healthy Home Coach," which connects to a smartphone app to inform users of their home's air quality, humidity, temperature, and noise level (via Engadget). As a plus, users of the company's smart indoor climate monitor will be able to integrate the system with Apple's HomeKit and use Siri to interact with the Netatmo device. 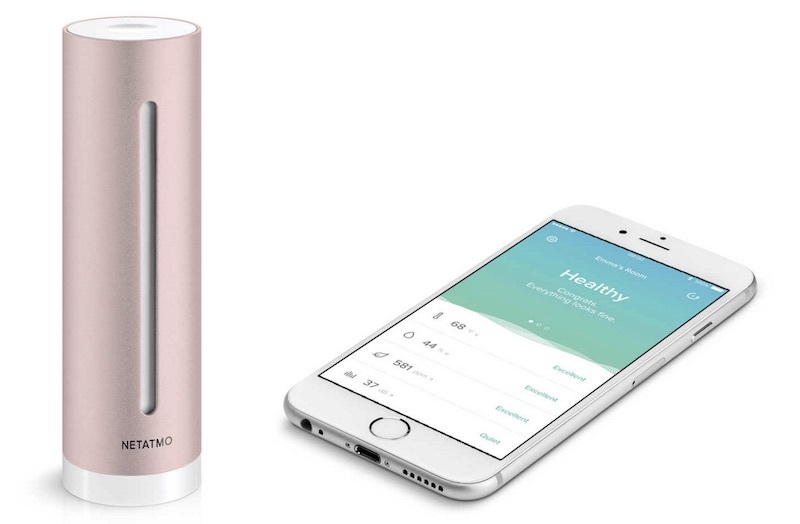 Netatmo designed the Healthy Home Coach with the same aesthetic of its security and weather devices, but with the specific goal of elevating the well-being and user awareness of a home's healthy environment. The company says that the device allows users to discover the precise noise level for sound sleeping, and guides them in adjusting a humidifier to hit the target humidity levels for someone with asthma. The Healthy Home Coach can also tip users and tell them when to adjust the ventilation of a room to balance out air quality -- for better concentration, according to Netatmo -- and warn them when their home's temperature isn't at the right level. The device's connected iOS app pushes out these notifications and tells users when the air quality, temperature, humidity, or noise level is acting out of their pre-set parameters, so they can subsequently address the warning before it becomes a problem. HomeKit integration isn't divulged with many specifics, but Netatmo says that users can "ask Siri how healthy your home is," and receive an audible diagnosis from the Healthy Home Coach's various information readouts. Anyone interested can purchase Netatmo's Healthy Home Coach from the company's website for $99.99. Although the range of the system isn't given, Netatmo says that it is "easily expandable," so additional monitors can be added into other rooms of a home where only one device can't reach. Cool, so it's like a smart thermostat, humidifier, ambient noise machine, and air purifier, all in one, except it only does the monitoring part on each and can't actually control anything, so it's actually completely useless. Only $100. What a steal! I'd say it's useful for people who don't trust "cloud" nonsense to actually manage those things. There have been an awful lot of cases lately of thermostats crashing (or losing their connections to the public servers) and locking the heat on during the summer. Or not turning the heat on during the winter and letting the pipes freeze. Or "smart" pet feeders having some kind of hiccup that causes them to not feed your pets for a week (for extra fun, try when you're on vacation!). Or "smart" lights that refuse to let you turn them on or off until you apply a software update. This gives you the information to adjust "dumb" devices to where they should be. I'm not interested in one, but I could see why someone might be. If you own the Netatmo Indoor / Outdoor weather system, does this compliment or replace the existing system? Whats the differenxe to the existing Netatmo? It already measures CO2 - ambient noise, humidity and temperature. If this allowed the weather station equipment that I already own to connect to HomeKit then I would buy it for that, but I don't see that Isted anywhere in the specs. I have emailed Netatmo to ask. I'll report back. Not hopeful though.